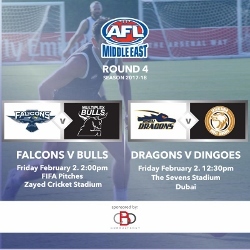 After a break since late November, the AFL Middle East competition gets under way again this week with two matches in the United Arab Emirates - one in Dubai and the other in Abu Dhabi. As with all matches in a four-team competition, both matches will have implications for the upcoming finals series. The Round Four clashes will see the Dubai Dragons take on the Entertainer Dubai Dingoes at The Sevens Stadium in Dubai at 12.30pm. Shortly afterwards in Abu Dhabi, the home team will host the Multiplex Bulls at 2.00pm at the Zayed Cricket Stadium. Victory for any team will brighten finals hopes with three rounds to go. Even the Dingoes, three defeats from three starts to date, could still turn their fortunes around. The Dragons sit undefeated on top of the ladder and will be favoured to defeat the Dingoes. Already a game clear of second-placed Bulls, the Dragons will be hard to dislodge from the minor premiership position should they win. For the Dingoes to have any finals hope their resurgence must start Friday with an upset against the Dragons. The battle between the Falcons and Bulls promises to be huge. The Falcons have just one win to date – against the Dingoes – but have been competitive against both the Dragons and the Bulls earlier in the season. A win here could catapult them right back into the finals frame, though the Bulls will also see this game as their chance to repair their own premiership credentials so they will not treat the game lightly. Whilst all clubs have been training over the break, last weekend’s International Rules clash between the Multiplex Bulls and Muscat Magpies will see the Bulls just a little more match fit, which might be an advantage returning from the break. It promises to be an exciting round of football in any case for all involved on and off the field.